(CookingLight.com) -- So you're invited to a Super Bowl party and you're wanting to bring a dish for the pregame feasting that's easy to make. Here's a new twist on a terrific cheesy bean dip recipe that helps keep the fat content low while spicing up the taste a little. The Cooking Light Reader: Jennifer Valenti, 27, loan officer, Alabaster, Alabama. The Story: An avid entertainer, Valenti has a playbook of tasty party recipes that she calls on for quick and easy crowd-pleasers. This bean dip, which uses several canned or bottled items and preshredded cheese, has been a long-time favorite. But since Valenti has a history of diabetes in her family and works to maintain a healthful weight, it's become more important for her to prepare good-for-you foods. "I knew the fat content was high, so I tried serving the dip with packaged baked chips, which didn't go over well," she says. "I experimented with low-fat products but couldn't quite get the flavors right. The dish needs a little excitement, but I want to keep the comforting appeal of the dip." Valenti turned to Cooking Light for help with her high-fat predicament. The Dilemma: Served with corn chips, the dip included one cup each of shredded cheese and regular sour cream. A portion of this appetizer had more than its fair share of fat and calories. Each contained six grams of saturated fat, about a third of the recommended daily limit for a 2,000-calorie diet, according to the USDA Dietary Guidelines. The sodium was also excessive, with each serving packing 20 percent of the daily sodium allowance recommended by the American Heart Association. The Solution: To reinvent this dip, our first step was to trade the heavy corn chips for healthier homemade flour tortilla chips. This cut almost nine grams of fat and 87 calories per serving and allowed us to keep regular cheese in the recipe. To further reduce fat, we switched from regular sour cream to light, trimming another gram of fat per serving. We also slightly reduced the amount of sour cream and cheese to keep calories and fat in check. Changing sliced olives to chopped allowed for better distribution of a slightly smaller amount and shaved 25 milligrams of sodium per serving. Using organic refried beans and salsa also helped manage sodium levels, dropping 141 milligrams per serving. A little fresh lime juice and ground cumin perked up the flavor of the beans without adding extra calories. The Feedback: The addition of lime juice and cumin to the beans was a huge hit with Valenti. Even with less cheese, she says, the corn, beans, and toppings are a good balance of earthy, sweet, and salty flavors. "I thought I would miss the cheese since there's a little less, but I tasted more of the other dip ingredients, and that was a nice change," she notes. "I will definitely feel good serving this new and improved dip at my next get-together." Lightly spray wedges with cooking spray and sprinkle with paprika. Bake at 350° for 15 minutes or until lightly browned and crisp. Cool. Combine juice, cumin, and beans in a medium bowl, stirring until well combined. Spread mixture evenly into an 11 x 7--inch baking dish coated with cooking spray. Spread salsa evenly over beans. 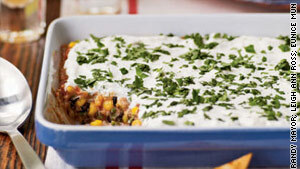 Combine corn, onions, and olives; spoon corn mixture evenly over salsa. Sprinkle cheese over corn mixture. Bake at 350° for 20 minutes or until bubbly. Let stand 10 minutes. Top with sour cream; sprinkle with cilantro. Serve with tortilla chips. Copyright 2011 Cooking Light magazine. All rights reserved.